While deciding on a card to post, this card stood out. Way out. 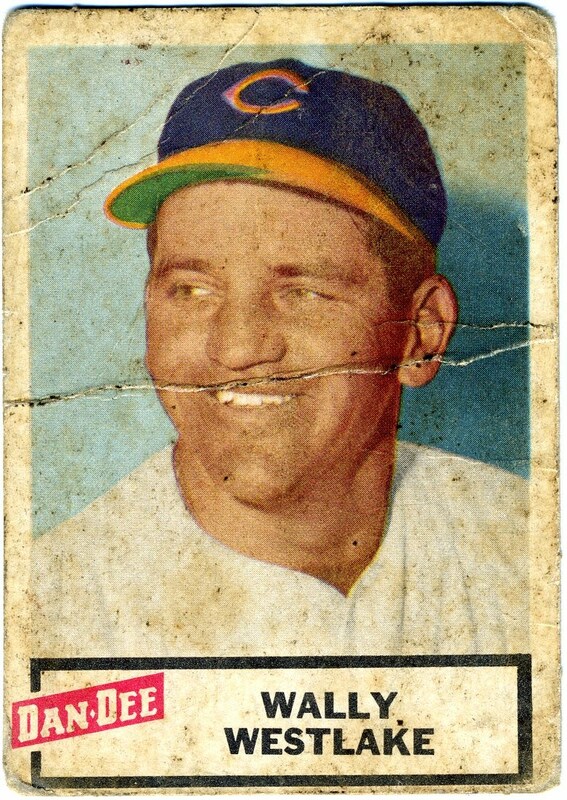 Maybe it was the bold colors of this 1953 Topps card. Maybe it was the 1950s feel of the old advertising peeking over Slaughter's shoulder. Maybe it was the fact that it was just plain worn. This card has some definite mileage. This is my kind of card. You just know that some kid carried this thing in his back pocket for the entire 1953 season. At least that's what it looks like. That's half the fun of owning a poor old baseball card. Wondering where it's been. 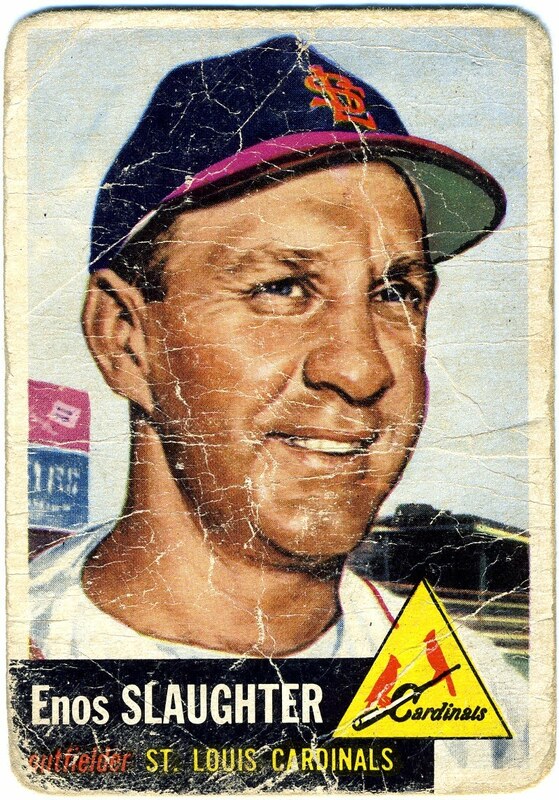 So not only does Wally Westlake have a giant fold going across his face, but this card is totally slick. Dan Dees have a wax coating that kept the potato chip grease from penetrating the cardboard. Sounds odd, but these cards were sold floating in bags of Dan Dee Hylo-ized Potato Chips. I can just imagine pulling one of these cards for the first time. I wonder if they had wet wipes in 1954? So they spelled his name wrong. Schang is probably considered the best catcher during baseball's deadball era. He hit .300 or better six times in a career that included three world championships. 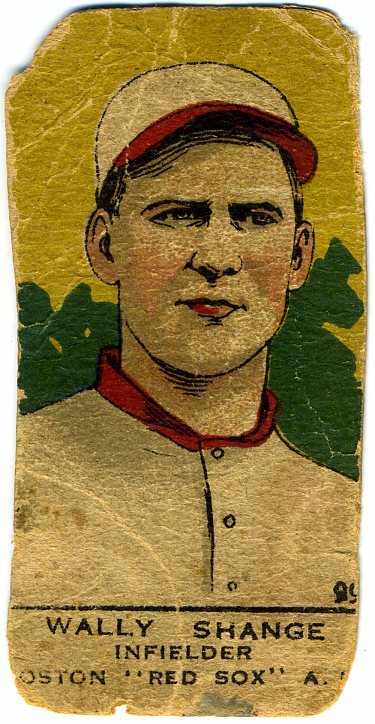 His first title was with Philadelphia A's in 1913. He moved on to play with Boston in 1918 where he completed the battery with a certain George Herman Ruth. Yes, Ruth was a pitcher with the Red Sox before becoming the original home run king. In Boston, Schang would help the Red Sox to a World Series championship in 1918. He followed Ruth to New York after the 1920 season. Ruth was traded a year earlier by Boston owner Harry Frazee. He won his final World Series title with the Yankees in 1923. With those credentials, they could have at least spelled his name right.